A gorgeous sunrise on the Atlantic in the OBX. For the last 12 years my family has been making an annual trip to the Outer Banks of North Carolina for our summer vacation. We stay at the same place every single year and go the same week in June, without fail. We are creatures of habit. Ryley and his cousin Kane goofing off at putt-putt. Posing for a picture with my gorgeous wife, sucking in the gut. Going on vacation to the same place, the same time, every year has its advantages and disadvantages. Our first year there we were lucky enough to become friends with a family that, like us, makes the annual trek to the same location at the same time. They come from Texas to spend time with their extended family for a week each year. Our kids have grown up together and I feel like we have become part of the extended family ourselves, distance cousins if you will. There is just something about the familiarity of the place and the people that make it feel more like home instead of a getaway. One of the downsides to the feeling of belonging there is that after 12 years you run out of new things to do. We have done most of the touristy things and at times still find ourselves playing putt-putt (Any doubt who won this year?). Ryley doing what he does best, catching striper even when we are in NC. Three years ago I decided it was time to charter a boat and head out into the Bay for some fishing with the kids. I did my internet research and located a guide names Dave Lusk from Salt Minded Charters. I chose Captain Dave because he did a great job of constantly updating his blog with fishing reports, day after day, month after month and year after year. Ryley with his fluke from our 2014 trip. 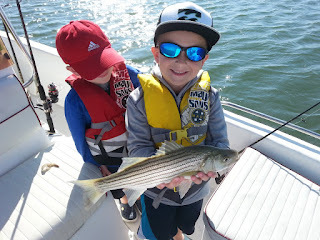 That first year we did ok. We ended up with a few small stripers and a throwback flounder, but the kids had a great time and enjoyed catching fish. Last year was a total bust. We went out searching for cobia for four hours but came up empty. The kids said they didn’t have any fun and I vowed to change that this year. So I got in touch with Captain Dave early on and we made a plan. 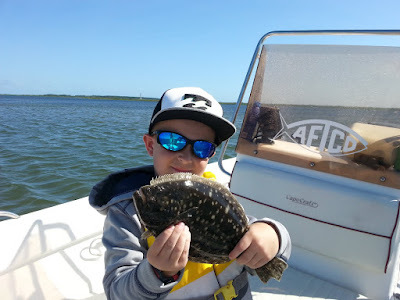 To keep the kids interested and hopefully catching some fish we would head out to one of the wrecks for amberjacks and bottom fish. On the way out and way back in we would look for cobia and mahi-mahi. In order to do this we would need to book a ¾ day trip at a minimum. It sounded like the perfect plan; more fish and more time on the water. I even convinced my friend Scott to join us on the trip with his son (they are the family we have been vacationing with from Texas for the past 12 years). Got all the gear packed up and ready to hit the road. Then right before we left for vacation I received an email from Captain Dave that his boat was in need of repair and the item wouldn’t be in until the day after our planned trip. We were heartbroken. Captain Dave did say he would try and find us another boat to go out on if he could. So as we left for the beach we were unsure if we would be able to go fishing at all. What a way to start the trip. Our view for the week. As if things couldn’t get any worse we arrived at the Outer Banks to a tremendous front that was sending a steady off shore breeze our way. For the first three days of our vacation the red flag was up and no one could get in the water. In the end it wouldn’t have mattered if the boat had been working, we wouldn’t have been able to go out in the Atlantic because the ocean was nothing but whitecaps. The only silver lining to those first few days was that it wasn’t hot and humid and didn’t rain at all. A little gear testing (and relaxing) at the beach. But things continued to get worse before they would get better. On Monday evening Captain Dave called to let us know he wasn’t able to get us on any other boats but he would be willing to take us our on a half day trip on Wednesday at 3:30 if we wanted. He was willing to do a three trip day because he felt bad about us missing out on our trip on Monday. This lifted our spirits some as a little fishing is always better than no fishing. Me and my Costas (and my wife!) before they went for a swim. So on Tuesday when the red flag was lifted we were able to get out into the waves for the first time all vacation. Turns out, it was the last time for me. No sooner did I take Ryley out in the surf than a big wave came and crashed into us both. I was able to hold onto Ryley with ease but my hat and Costa Del Mar sunglasses were swept off my head. I was able to recover my Costa visor but my glasses went for a swim and never made it back. I just don’t seem to have much luck with my Costas lately. Yours truly with my new hat, taking int he slack on my line. As much as it pained me to lose my favorite pair of glasses I didn’t let that rain on our parade. We had a great time at the beach and I managed to pick up a nice Quiksilver straw hat to help shield my eyes from the sun. On Wednesday we ended our beach time a little early and got ourselves ready for our fishing adventure. The time was here to redeem ourselves from last year’s fiasco. About 15 minutes into the drive we stopped at TW Tackle to get last minute supplies and an extremely tight pair of sunglasses for my big fat head. No sooner did we get back on the road then I got a message from Captain Dave saying that he was headed back in with his last client and the boat was acting up again and he would have to pull it for repairs. Yeah just when I thought it couldn’t get worse it actually did. We turned around and headed back home officially skunked in our efforts to go fishing while at the Outer Banks. For one of our last adventures of our vacation we decided to try and make a trip to Ocracoke Island, about a 2 hr drive from our place in Kitty Hawk. We managed to make good time down to the Ferry in Cape Hatteras, but by the time we got there the wait and ferry ride time made it impossible for us to visit the island (the wait to get on the ferry was 2+ hrs and then an hour ride over to the island). We decided to stay in the Hatteras area and have lunch and look for something fun for the kids to do. Kane with his first blue crab. We happened upon a small little place called Hatteras Island Ocean Center where the kids learned about the local ecology and got first-hand experience in catching blue crabs on a hand line. We piled back in the truck and headed home but not before we stopped at a local tackle shop/outfitters and picked up some artificial bait. I had an idea on how to salvage our fishing experience and hopefully had found the silver bullet to pull it off. Ryley and I with his first croaker from the beach. Kane with his first fish of the trip. Sometimes in fishing, and life, you see these crazy ideas which people come up with that fail miserably and you often wonder “What were they thinking!” But there are those occasions when their idea is revolutionary and honestly makes you wonder “Why didn’t I think of that!” One such item, I discovered while on vacation, was an artificial bait called Fishbites. Now this isn’t exactly a brand new bait, but it sure is new to me! That little pouch of “Long Lasting EZ Flea” bait was our ticket to success. We had been attempting to fish from the beach all week with not even a nibble to show for it (which is exactly what happened every other year as well). So instead of cut bait I threw on some EZ Flea Fishbites and no sooner did the bait hit the water than did we feel some solid strikes on the line. We managed to pull in once nice size croaker when I realized the size hook we were using was just too big. After a quick tackle swap we were in business. Nearly every cast we had a fish on. The kids were excited to be catching something, anything out of the water. I think we fished for a couple of hours from the beach and the bite was strong the entire time. I even managed to capture some video of Ryley reeling in his first ever fish from the surf.